"When you look at satellite images of the region, you can see areas of cold sea-surface temperatures in winter," says Gualtiero Spiro Jaeger, a MIT-WHOI Joint Program graduate student and lead author of the paper that published online Feb. 28, 2018, in the journal Science Advances. "It looks like there's cold, nutrient-rich waters at the surface, but there actually isn't." "While this is unlikely to have wide-ranging implications for the monsoon or climate dynamics, it does influence the movement of the water and nutrients," Jaeger adds. 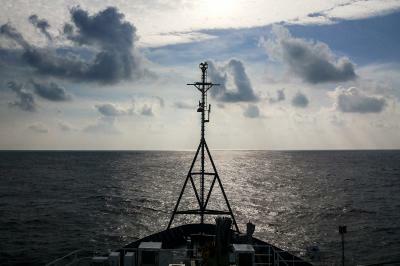 The research team collected the data used in the study during an Indian Ocean expedition in the winter of 2013. The work was done as part of the multi-year Air-Sea Interaction Regional Initiative, which focuses on advancing understanding of the monsoons and the interactions between the ocean and the atmosphere. The initiative is funded by the Of?ce of Naval Research and was conducted in collaboration with the Ministry of Earth Sciences in India. "It's an international collaboration that has fostered ocean measurements in a region that was very under-sampled in the past," says coauthor Amala Mahadevan, a WHOI scientist who develops models of evolving oceanic processes. "Now, in collaboration with oceanographers from India, we're making high-resolution measurements with autonomous instruments and ship-based expeditions over several years."